We’ve all fallen victim to it at some point in our lives, but do we really understand the impact fatigue can have on our bodies and even those around us? 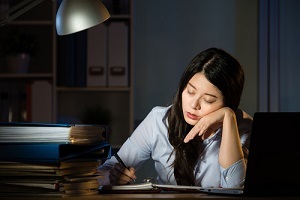 Fatigue is a state of feeling tired, weary or sleepy from insufficient sleep, prolonged mental or physical work, or extended periods of stress or anxiety. Fatigue can be described as either acute or chronic. Symptoms are similar to the flu, last longer than 6 months and interfere with certain activities. Both types of fatigue can stem from the way we carry out our daily activities, including our jobs, and increase the risk of workplace injuries. Unfortunately, there are conditions that can increase the negative effect of normal stress and fatigue from daily activities, causing health problems and a lower quality of life. One such condition is sleep disordered breathing. Sleep-Disordered breathing (SDB) describes a group of disorders characterized by abnormalities of respiratory pattern (pauses in breathing) or the quantity of ventilation during sleep. Obstructive sleep apnea (OSA), the most common such disorder, occurs when the airway is blocked when the muscles of the upper airway relax during sleep, causing breathing to stop often for more than 10 seconds. This occurs repeatedly during sleep. Its no secret that workplace fatigue can be a contributing factor to serious car crashes. In fact, 20% of serious vehicle accidents are linked to driver sleepiness. Driving while tired or fatigued is similar in magnitude to driving while under the influence of alcohol. Eat well. A small healthy snack during work breaks will keep your body going. Institute of Medicine (US) Committee on Sleep Medicine and Research; Colten HR, Altevogt BM, editors. Sleep Disorders and Sleep Deprivation: An unmet Public Health Problem, Washington DC: National Academies Press (US) 2006 pg 4.
what to expect from cpap therapy?